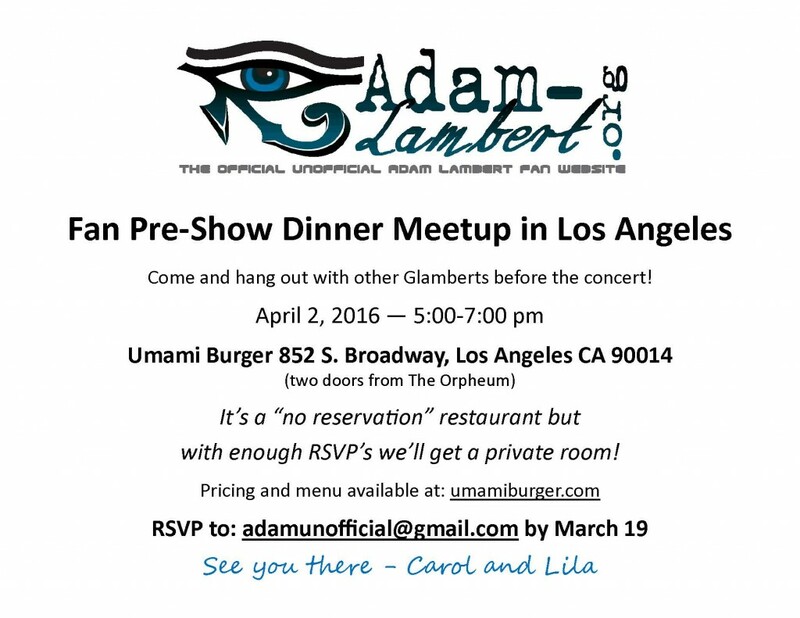 Our pre-show fan dinner at Umami Burger on April 2 is filling up fast. We’ve only got space for a few more, so if you’re still thinking about coming but haven’t RSVP’d, now is the time! By being at the theatre early (it’s two doors away) you’ll get early access to parking. There are several lots within 2 blocks from the Umami/Orpheum. See below for changes to this flyer. Our start time is now 4:30 PM to accommodate those with VIP/Meet and Greet tickets. With such a great response, we’ve secured a private room. Umami Burger will be offering a set menu with regular and dietary specialty choices. I’ll post it with prices, when it’s ready. Email your RSVP, including # in your group to adamunofficial@gmail.com. In the flyer above, the email address is not an active link but the one in this bullet is. If it’s not working for you, copy/paste or type in the email address. It was great to see you again! It’s so nice that we get to see our now “old” friends at these concerts. Checking on news about The Original High Tour date April 3rd? Thank you Carol, for organizing the pre concert dinner for April 2nd. It was a wonderful, memorable night and gave so many of us a chance to share our love for Adam .Such a joyful, beautiful gathering ! Thank you so much! It was an amazing weekend. I’m glad we could all share it together!